A warm, welcoming sight to tug at your heartstrings, these softly glowing hearts seem crafted of delicate chipped crystal. But the ten heart-shaped lights - won't break. 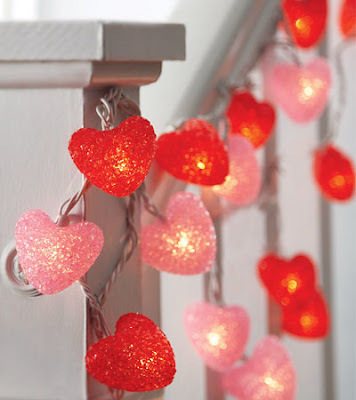 Our soft-hearted lights are created from puffs of pliable plastic, and make wonderful decorations for Valentine's Day (and every day)! 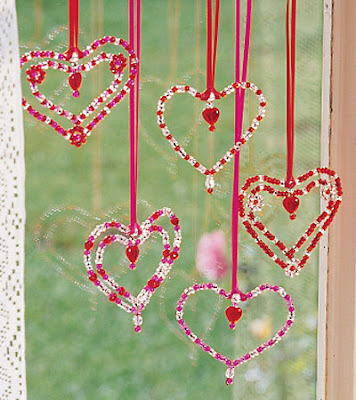 Catch your Valentine's eye with sparkly hearts that are easy to make and beautiful to behold - especially when sunlight shines through the bright beads. Designed exclusively for HearthSong, our kit comes with hundreds of quality beads, including Czech glass and heart-shaped beads, plus fine metal wire, satin ribbon for hanging, and step-by-step illustrated instructions. There's enough material to make five hearts in three different styles. Why not give these exquisite beaded creations to special friends as a heartfelt token of your love? Create one-of-a-kind "gifts from the heart." 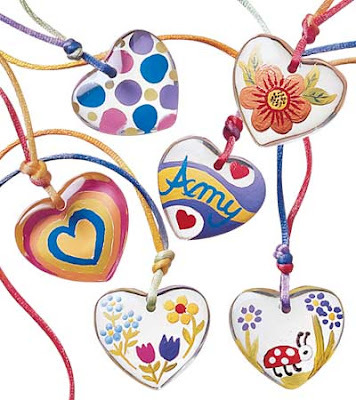 Six 1½" hearts of transparent polyresin come ready to decorate with special paints in six springtime colors, fine-tipped brush, craft stick and permanent marker. Kit includes six yards of lustrous, rainbow-hued rayon cording. Open your own rotating art gallery. Slide five of your favorite masterpieces into the pre-fitted openings (one 11" x 14", four 8" x 10') to proudly display your original artwork. 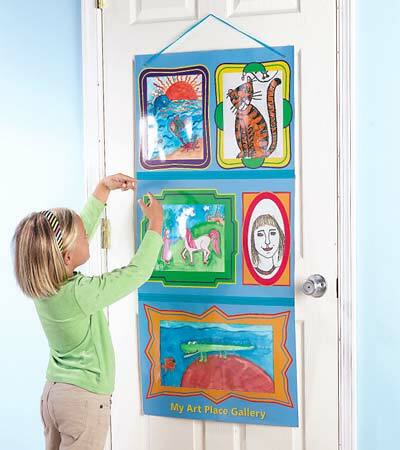 It's simple to swap pieces in and out to create an ever-changing art show with your most current creations. Constructed of sturdy paperboard and acetate to protect those valuable one-of-a-kind originals and hold artwork securely in place. For ages 3 and up. Ever since I happened upon Hearth Song, I've had a hard time shopping in traditional toy stores, none, in my opinion come close in comparison. The unique selection of toys, games, and arts & crafts (many exclusive to Hearth Song) is exactly what I'm looking for as a mother. I want my children to grow through imaginative play, and through creating, and Hearth Song offers a variety of item's that allow them to do just that! With the upcoming Valentines Holiday and being that we are a crafty kind of family, I was overjoyed to see all of the creative projects and decorations offered at Hearth Song! We were sent the Hearth String Lights, the Beaded Hearts Kit, the Color My Heart Pendants Kit, and the My Art Place Hanging Art Gallery for review, and WOW! Next we broke out the Color My Heart Pendant Kit. The kid's got to make two pendants each (and mommy made one too ;). They had a wonderful time painting little designs on each (you can plan out your design on the included practice sheet before you start) and writing a little message with the included permanent pen. The finished product is so cute, and would make a wonderful gift for that special someone (or a great gift for grand mom). A few day's later we had a big snow storm, and were stuck inside for the day. However, we managed to make our own fun with the Beaded Hearts Kit! With a collection of beads, and wire we set out to make these little beauties as special gifts for family member's this Holiday. And while it was a little difficult for the princess (she's slightly under the recommended age) B easily assembled his heart with a little assistance from myself. While browsing through the arts & crafts section the My Art Place Hanging Art Gallery caught my eye. We have quite a few pictures that are hanging on our refrigerator, and while I LOVE to enjoy the kid's art work, they have a tendency to fall off when we open and close the refrigerator & freezer door. This was the perfect way to remedy that! We hung it on a hook on the Playroom door, and the kid's not only love it, they have so much pride seeing their creations displayed in the My Art Place Hanging Gallery! Really, AWESOME! We are thinking of ordering them each one for their bedroom doors. We absolutely adore Hearth Song, take a moment to check out their selection..... I know you'll be just as impressed as I am! Celebrate Valentines Day with Hearth Song! One Lucky Reader will receive a $50 Gift Certificate to Hearth Song! Leave a comment~Visit http://www.hearthsong.com/ and let me know another item that you would love to have for your little one. The comment is considered your entry. 2) Tweet ~ Celebrate Valentines Day with Hearth Song! #Win a $50 Gift Card @savvycouponmom http://bit.ly/hiJAZq #Giveaway (can be repeated twice daily for additional entries~ copy paste please~cut and paste- the bit link must be posted in the tweet - I will check) (Additional 5 Entries - 5 Comments). Entry to this giveaway ends at 12pm PST February 25, 2011. Winner's are chosen randomly through random.org. The winner will be announced in a post within 7 days of the giveaway ending, and contacted through email. The winner will have 48 hrs. to respond or another winner will be chosen. I'd buy the Pink Petal dress-up costume and a Glam Her. I follow Hearthsong on Twitter. I would love the art hanging display or the portfolio for my daughter's artwork! I would love to have the dodge tag game for my kids.